The Institute of Medicine states that 75 percent of Americans have chronic dehydration. Unfortunately, dehydration not only impacts athletic functions but general health and wellness, too. For this reason, it is vital to familiarize yourself with the basics of hydration so that you’ll able to make sure that you don’t suffer from it. It is also crucial to look at hydration differently – one is with physical activity like working out and the other with none such as in a sedentary lifestyle since the body responds to external factors such as heat in a different way. Knowing the fundamental recommendations for getting hydrated and how to examine your thirst is essential to prevent dehydration and feel well and heath every day. Surely, you’ve heard about your parents or grandparents telling you to consume at least eight glasses of water per day. This recommendation, however, is outdated. Now, the Institute of Medicine has a new recommendation: 3.7 liters or 15 cups for the average adult male and 2.7 liters of 11 cups for females. Of course, one’s water requirements also depend on age, gender, location, activity intensity and temperature. Since there isn’t any specific number for everyone, people usually assess hydration levels through their thirst. This basically means that you need to start drinking from the time you wake up in the morning and the consistently throughout the day. The body doesn’t naturally produce water. Hence, it’s our duty to replenish our supply for the body to function with efficacy and for overall health. As you know, fluid gets depleted from skin evaporation, urine, stool, and even breathing, thus, consistent refilling is a must. Moreover, in terms of hydration, it is also important to note that water isn’t the only liquid for getting hydrated. We can also get hydrated from other drinks, such as coffee and tea, as well as from fruits and veggies. Thus, depending on what your diet is like daily, you’re not required to exclusively get your hydration powers from water alone. If you’re not doing anything physically intense, such as working at your desk for the most part of the day, your hydration requirement is fine at its basics. This is because engaging in sedentary activities won’t make you sweat and lose sodium like you would while doing rigorous physical activities, except if it’s hot and you’re losing water and sodium through sweat. Of course, the best thing to drink is water since it’s cheap and free from calories, unlike sports drinks with added sugar. As you’re going through the day, be mindful of the amount of fluid you’re consuming. Most people can quantify their hydration levels through their thirst and urination. Basically, the core guideline is that if you’re feeling thirsty, even for just a little bit, it may mean you’re already dehydrated. It’s essential to not wait until you’re very thirsty to get yourself a glass of water. On the other hand, this shouldn’t alarm you into drinking too much as this can lead to hyperhydration and your blood getting diluted. 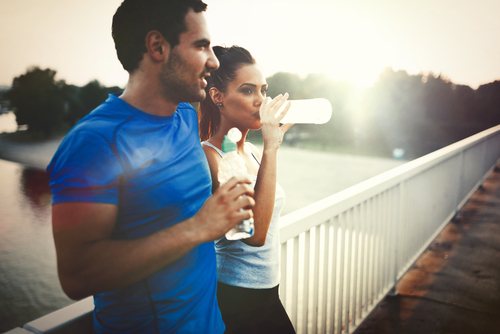 If you’re working out, your hydration regimen won’t be like your standard routine. For apparent reasons, it is vital to go into training fully hydrated. When engaging in a vigorous activity, you need to hydrate prior, during and after your exercise. However, it is also crucial to note that thirst cues aren’t dependable during your workout as they are throughout sedentary activity. This is because the body’s thirst signals can’t keep up with what you really require during exercise. This is why athletes, for instance, rely on calculating sweat rate as another means of assessing their hydration. Calculating sweat rate is especially more important during summer since the body perspires more due to stifling heat. As a matter of fact, dropping just two percent of your body weight comprised of fluid is substantial enough to compromise your physical functions and performance. Given this, weighing yourself before and after workout will make you aware of how much you lost in perspiration. This way, you can suitably ingest more liquids after exercise as means of replenishment. Furthermore, it’s also vital to have electrolyte supplementation to your hydration regimen if you’re engaging in vigorous physical activity that goes beyond a span of an hour. 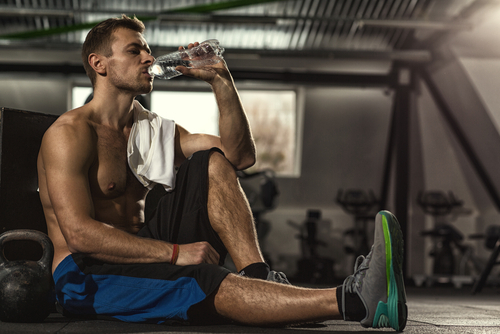 Water is good enough as means of replenishment for exercises below an hour. But if it goes longer than that, supplementing with electrolytes can considerably help replenish what your body is losing. Sweating also means you’re losing sodium, which is required for proper muscle contractions. There’s also the misconception about coconut water being perfect for hydration during an exercise. It’s not – simply because it is high in potassium and not sodium. When it comes to physical intensity, something that has a higher amount of sodium is a better bet. 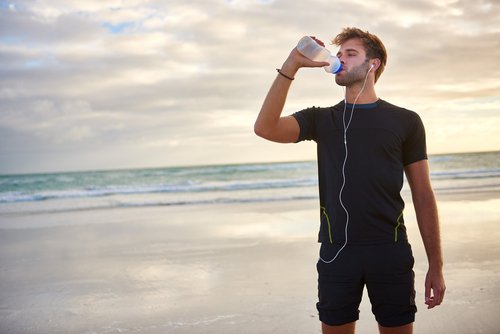 Sports drinks are also the better option if your training session is for over an hour and it it’s vigorous or if you’re working outside in the heat. Such drinks are a better bet for refilling glycogen supplies, electrolytes, and maximizing functions and performance. Finally, it is also necessary to discuss hydration levels with your doctor because there are certain health issues that call for fluid constraints.